My husband and I recently returned from a two week trip to Italy. 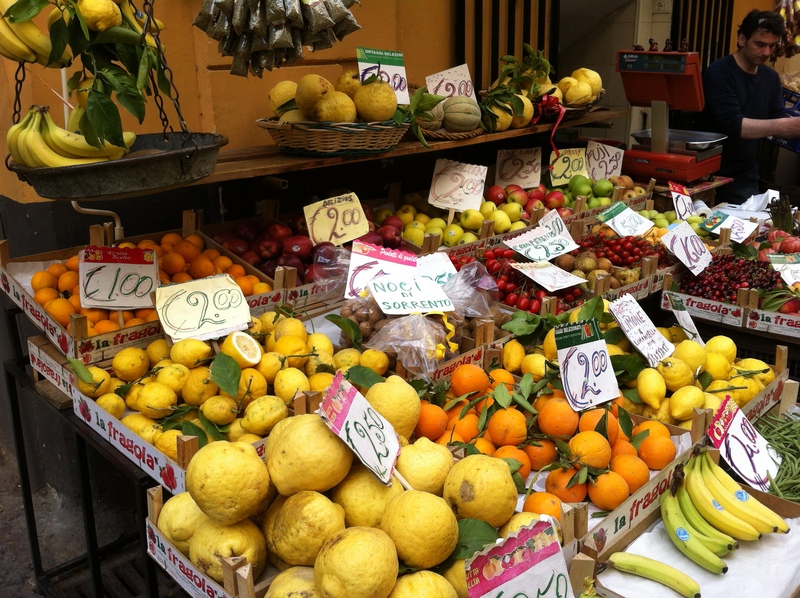 What a surprise…when we arrived in Sorrento and realized that there were lemon trees and lemons everywhere! This area along the coast appeared to be the lemon capital of Italy. There was even an entire lemon orchard on our hotel grounds. Some of the lemons we saw were really huge…the size of grapefruits. I found out later that these are called “citrons” which are similar to lemons, but much bigger. My mom loves lemon anything. So for her birthday, I got her some soft lemon candies in the little village of Amalfi, along the beautiful coast. Then I added all kinds of lemon-themed gifts…napkins, hard candies, juicer, dip mix etc. She loved it! I even painted a gift bag with lemons, which came out really cute. Lemons are great in food, but also may be used in aromatherapy. Researchers at Ohio State University found out that lemon oil aroma can enhance our moods. So if you don’t have time to make lemon chicken, just get some lemon essential oils, or cut a lemon in half and smell it! When we lived in California, my friend Janet made this Lemon Chicken recipe for dinner. We serve it with mashed potatoes and wow, is it delicious! If using chicken breasts, pound the pieces until they are flat. Dredge chicken (breasts or pieces) in flour mixture and brown it in the oil. Mix remaining ingredients. Pour over chicken in a deep frying pan. Cover and simmer for 45 to 50 minutes. If using a crock-pot, cook on high 3-4 hours. Serve with mashed potatoes or rice. Delicious! I love lemons also. My daughter bought me a beautiful lemon bowl from Italy that you will have to come over and see. I love it and I love your blog. Way to go Liz! You got that right Lara! It was amazing and yes, a dream come true…Not sure wht Buonissimo means, but I think it’s good!? LEMONS!!! I LOVE LEMONS! LEMONS LUSCIOUS LEMONS!! !